Hilton Head Island is home to many great golf courses, both public and private, including Harbour Town Golf Links home of the Heritage Tournament on the PGA Tour, held each year the week after the Masters. There are three outstanding golf courses on Sea Pines Resort at the southern end of the island. The new Davis Love III design, Atlantic Dunes (formerly the Ocean Course) is a picturesque layout and a fun course to play with plenty of variety and breathtaking views. The challenging Heron Point is probably the toughest course on Hilton Head, designed by Pete Dye it is as develish as any of his layouts. If you dont have a good short game you can expect to run up a bit of a ricket score! The jewel in the crown, Harbour Town Golf Links is recognised by amateurs and pros alike as a proper but fair test of golf with it’s narrow fairways and tiny green complexes it asks that you place your ball in the right part of the fairway, not just anywhere. There are three 18 hole courses on Palmetto Dunes Plantation which rival the Sea Pines courses for quality, variety and spectacular views. The Robert Trent Jones course is the most well known due to it’s middle section which takes in several water hazards as well as a spectacular ocean view. The Arthur Hills course, possibly our favourite course on the island, is a class layout with plenty of interest and no little challenge. Built on a series of rolling dunes it is unusual in South Carolina courses in that it presents you with plenty of hanging lies. Water comes into play on ten holes so there is plenty to challenge you. Finally, the George Fazio course is one of the most challenging on the island with a series of long par fours with plenty of bunkers and water hazards it is a test of your long game. The Heritage group own several golf courses on the island and their multi round packages represent the best value golf on the island. There are three courses on Port Royal Plantation – Barony looks fairly inocuous off the tee and the greens are generous. However, they are protected by thick rough and unforgiving bunkers so this is a course where accuracy, not length, is paramount. Robbers Row is located on the scenic marsh side of the Port Royal Plantation and cuts through beautiful strands of magnolia and live oaks. This course sets atop former Civil War grounds and features historical markers throughout the course, describing events which took place on the Island. Although tee-shots have generous fairways to land in, approach shots require accuracy to the well-protected greens. Planters Row has water on 10 of the 18 holes and features narrow, tree-lined fairways with small undulating greens. 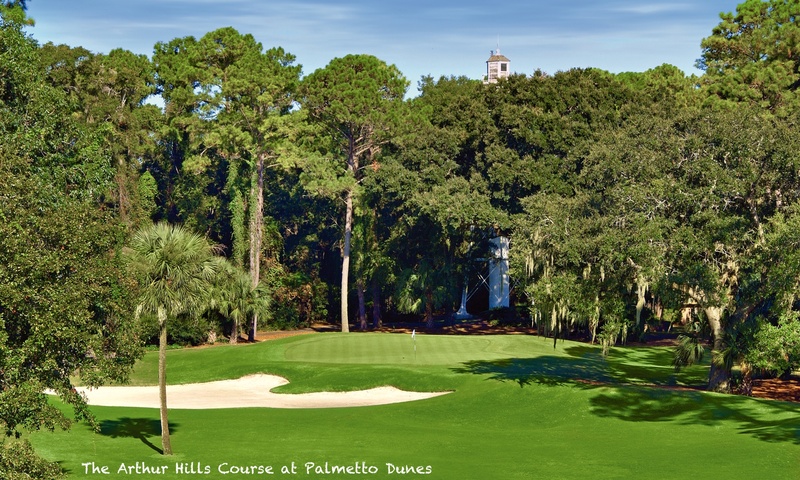 At nearby Palmetto Hall Plantation there are two courses. The Arthur Hills course is a heavily wooded layout with towering pines and moss-draped oaks. Several lakes add to the challenge of this excellent course. Well protected greens, edged with bunkers will test your approach play, while the signature par-4 18th hole offers a daunting finish to your round. The Robert Cupp course, one of our favourites is a unique and innovative layout with creative use of bunkering and the natural habitat to provide a variety of different challenges throughout your round. At the north end of the island is Oyster Reef, a Rees Jones design that winds around a series of lagoons and offers scenic views of the inlet to Port Royal Sound. Finally, at the south end of the island is Shipyard which has three nine hole layouts with tree-lined fairways and a combined 25 water hazards to keep you honest. There are several courses just off the island, two of which feature in our packages. Crescent Pointe is a wonderfully picturesque and interesting Arnold Palmer layout and we thoroughly recommend saving a day to try this challenging layout. Along with it’s sister course, the Davis Love designed Eagles Pointe, it represents the best value golf in the Hilton Head area. Eagle’s Pointe is not as interesting but the two round rates make for a great 36 hole day. To help plan your trip please take a look at our Hilton Head Island and Hilton Head Accommodation pages to help build your perfect trip.